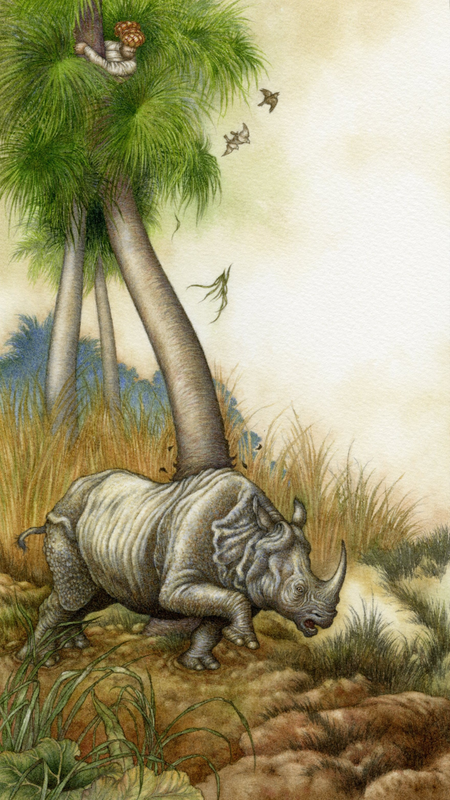 Illustration for How the Rhinoceros got his Skin, from Rudyard Kipling’s Just So Stories, published in a limited edition of 1,000 copies by The Folio Society, 2012. Watercolour on Saunders Waterford hot pressed; 150 x 260mm. 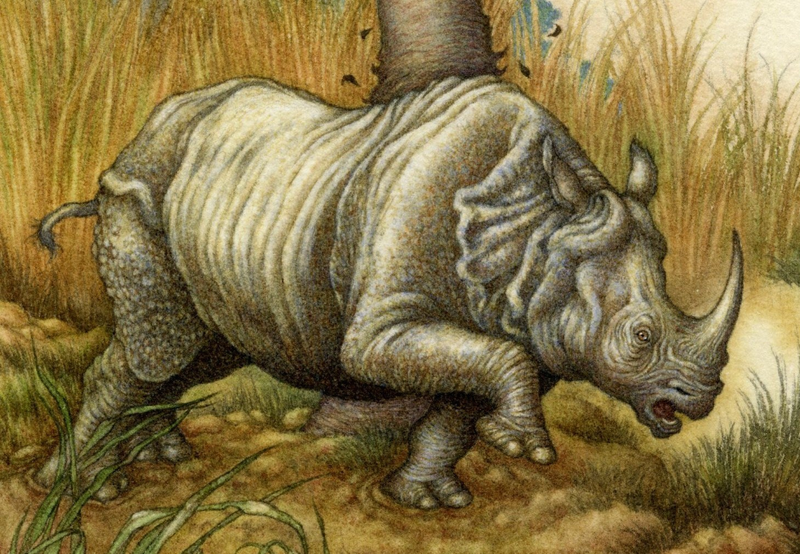 A detail of the rhinoceros (please click to enlarge, as with all images). Just a small reminder of the auction for the Robin Relief Fund on eBay. There is still over a day left on my Bidpai. Please spread the word if you know anyone who might be interested. There are many other works besides mine. All sales go towards new hands and legs for Robin Sullins. The Djinn rolled himself up in his dust-cloak, and took a bearing across the desert, and he found the Camel most ‘scruciatingly idle, looking at his own reflection in a pool of water. 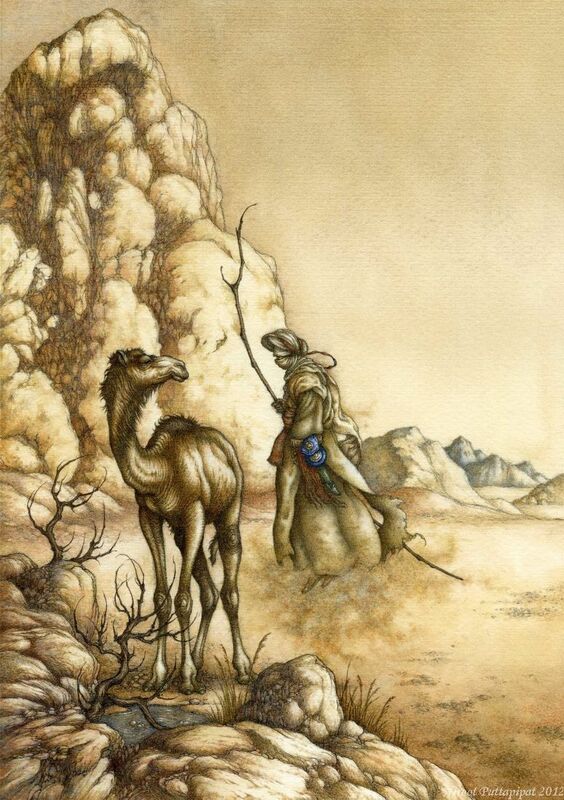 Illustration for How the Camel got his Hump, from Rudyard Kipling’s Just So Stories, published in a limited edition of 1,000 copies by The Folio Society, 2012. Watercolour on (old) Fabriano Artistico cold pressed, 180 x 255mm. Those garments won’t be quite so ‘transparent’ when the piece is complete. A little sneaky peek at my current project. 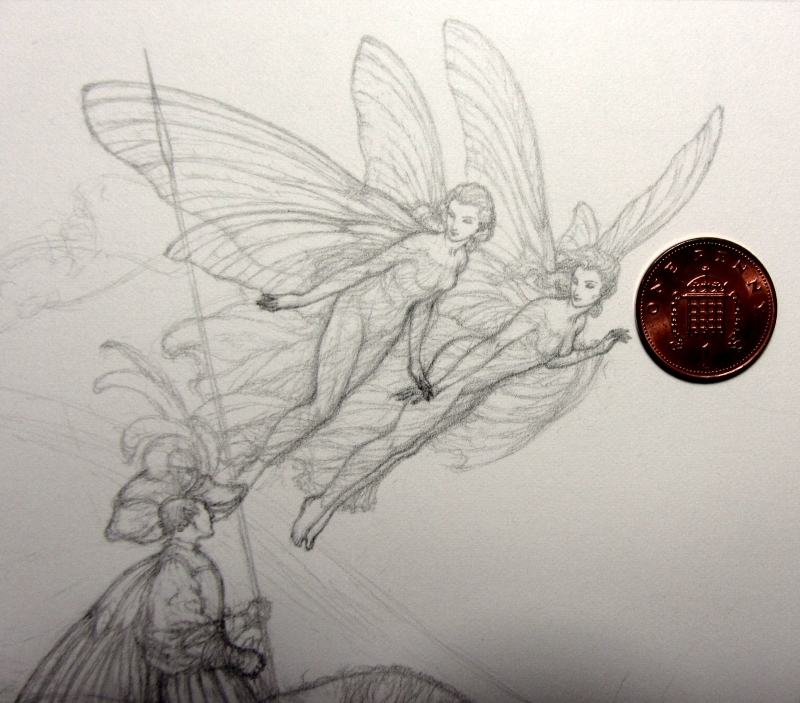 Those heads are about 5mm wide. If the Mughal miniaturists could do it, why couldn’t I? (Grits teeth) I’ve had to adjust the contrast quite strongly in this picture, but that coin is a penny. 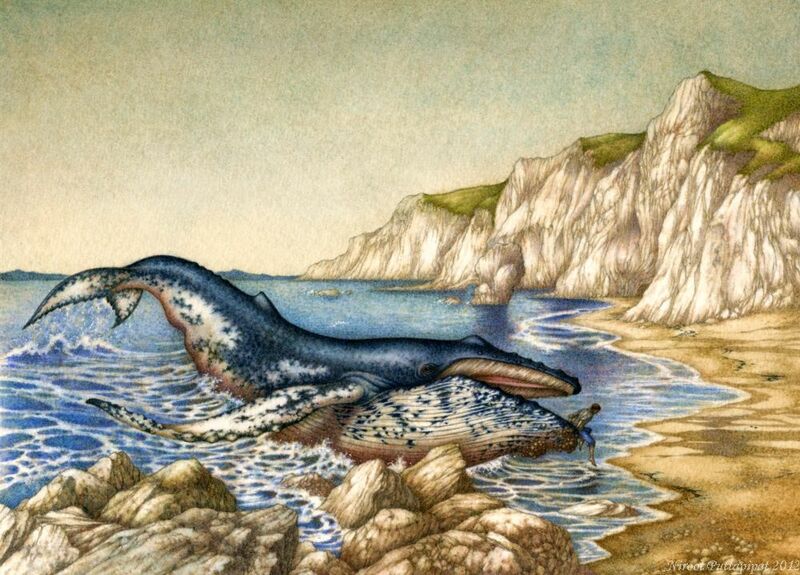 Illustration for How the Whale got his Throat, in Rudyard Kipling’s Just So Stories, published in a limited edition of 1,000 copies by The Folio Society, 2012. Watercolour on Saunders Waterford hot pressed, 255 x 180mm. 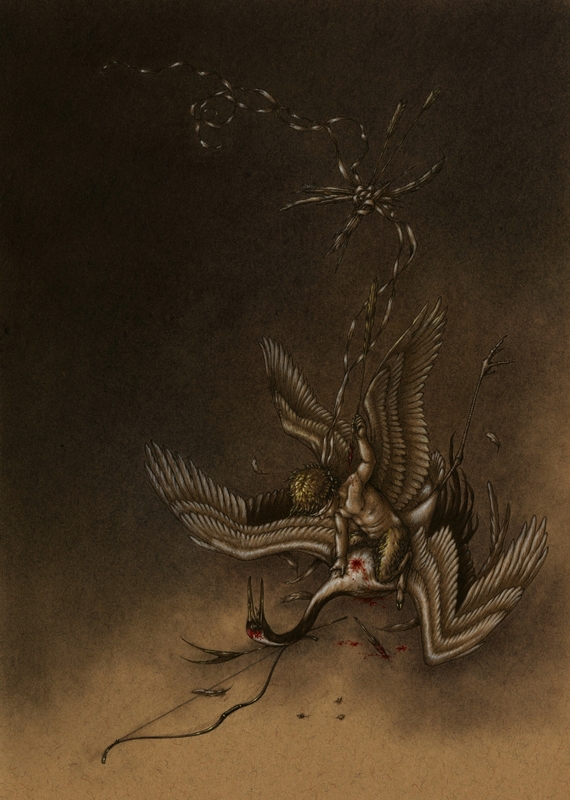 Pencil, sepia powder, inks and gouache; 2.5 x 3.5 inches. Initially inspired by my current project (more on that to come) and my recent visit to the Mughal India exhibition at the British Library, I have since decided to donate this piece to the Robin Sullins art auction, which begins on the 14th February. Robin’s fingers and legs required amputation after her body reacted violently following a dog bite, and she is presently spending her days in hospital. The auction was set up by her sister, Angi Sullins of Duirwaigh Studios. Please visit Robin’s Relief Fund to find out more and to donate, and spread the word, if you can; or bid on one of the artworks (there are works by many others) when the auction goes live. Time to refresh this neglected log. The Bi-Coloured-Python-Rock-Snake and I wish you a happy Chinese New Year. 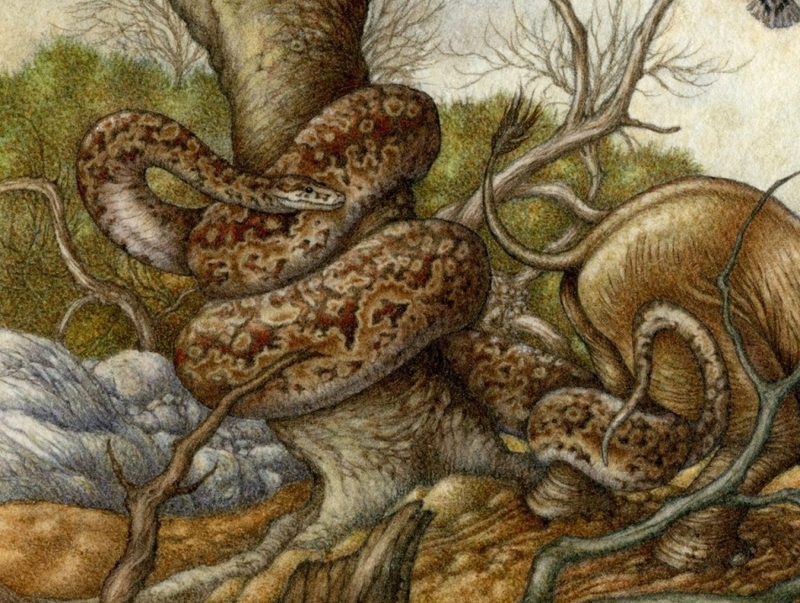 Detail from illustration for The Elephant’s Child, in Rudyard Kipling’s Just So Stories, published by The Folio Society, 2012. 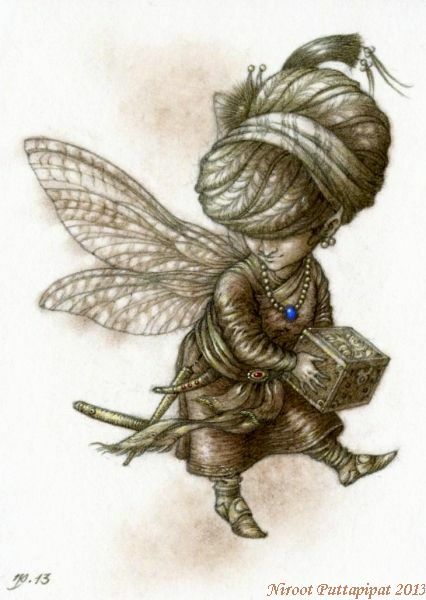 I will begin sharing some of the illustrations from Just So Stories by way of re-activation, so to speak. This book is my most recent and I believe contains some of my best work so far. I was almost tempted to start afresh entirely by deleting the very few entries I’d posted prior to this. But perhaps I should simply let them be. I also hope to gradually add some of the better pieces from among my older work to their own pages/galleries here (if such a thing is possible). There are still many WordPress features that I need to become accustomed to, so please bear with me.